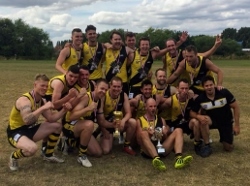 After a season of dominance where they remained undefeated, the Manchester Mozzies have won an extraordinary fifth consecutive premiership when they defeated the Nottingham Scorpions by 25 points. Their fifth flag in a row already propels the Mozzies to stratospheric heights on a worldwide football stage and they have no immediate plans to end their dominance, now being the proud owners of seven AFLCNE premierships. For the third straight year, the Nottingham Scorpions bravely stuck with the Manchester behemoth, but in the end could only be in awe of the ability of the Mozzies’ ability to keep finding ways to raise the bar – both on the field and across the history of the league. Playing the AFLCNE Grand-Final in front of a home crowd in Nottingham, the Scorpions stuck within striking distance of the Mozzies all day but couldn’t bridge the gap enough to catch them. This was despite having their adoring home fans cheering and offering all manner of advice from the sidelines. The first quarter saw both teams willingly attacking with seven scoring shots apiece, but superior accuracy saw the Mozzies go to the first break with a 10-point lead. The Scorpions were well in the match and did well to keep their opponents from burying them in the opening quarter. The second quarter was just as tight. In a very physical and tough arm wrestle, the Mozzies managed to creep further ahead, but were yet to break the game open. The Scorpions simply wouldn’t let them. The Mozzies knew they had a battle on their hands to take the flag. By the main break the Mozzies held a 14-point lead – not enough to win a premiership, yet still leaving the Scorpions with a half of football to bridge the gap. The “premiership” quarter is so often the turning point where a team breaks the shackles and sets up a game. However, the torrid fight continued. Neither side was prepared to give an inch in what was becoming a grand final for the ages. Both teams rammed home four goals for the quarter. Only a superior accuracy in front of goal kept the Mozzies ahead on the scoreboard by 16 points, having had 17 shots on goal to 16. The Scorpions were close enough to challenge in the final quarter. The final quarter saw both teams thrown everything at each other – and then some. The Mozzies were attacking frequently, but their own scoring yips were keeping the Scorpions alive. But as time ran down it was clear the Mozzies would prevail as they went on to a well-deserved and hard fought 25 point premiership win. The Mozzies are now nursing sore celebratory heads – the Scorpions broken hearts. Nevertheless, both teams put on a showcase of football to be proud of. Whilst there are post season and pre-season games and tournaments still to be played, the main planning will be for the Mozzie era to continue as they plan for 2019. Four other clubs (and hopefully more) go back to the drawing board and plot what will be required to hold up a cup of their own next season. But for now, the Manchester Mozzies are celebrating five premiership flags in a row – something quite extraordinary and deserving of hearty congratulations.